Now for some exclusive ideas from none other than Heather Nichols. "Hi everyone! This is Heather Nichols and I am so happy to be joining you today for Papertrey Ink’s Stamp-a-Faire event. I have a project to share that uses the traditional 7th anniversary gift of wool. The project features a layered wool felt technique that adds a great detail to wool embellishments. You will love how easy it is to do and how it leaves people wondering how you did it!" Die cut leaves from wool felt, making sure you have two leaves in contrasting colors for each leaf embellishment. Layer the leaves on top of each other and use a sewing machine to sew the vein details on the leaves using a very small stitch length. Trim off all excess thread ends. Hold the stitched leaf with the color you want as the vein detail facing up. Use sharp scissors and slip them between the felt layers to cut away the top layer of felt in between the stitching lines. On the right side of a circle die cut from white cardstock, stamp the berry image in Cocoa Bean, Canyon Clay, and Terracotta Tile inks. Stamp the sentiment to the left of the berry branch in Cocoa Bean ink. Attach the leaves onto the circle piece so that they are attached to the stamped berry image. Attach the circle piece to a card base die cut from kraft cardstock using the Noted: Scalloped Square die. Adhere clear confetti around the circle piece on the card front. Now it's your turn! Create a project featuring a stitched layered embellishment (felt or paper). You can choose to re-create the exact project from Heather above or design your own using the same concepts. Your project must also incorporate at least one Papertrey product. This technique could be applied to so many things other than cards! It is perfect for fall and definitely exudes that warm and cozy feeling. What other designs can you think to apply this technique to other than leaves? Do you prefer to hand stitch or use a sewing machine for things like this? We look forward to seeing your projects! Very clever stitching idea, love the finished look after snipping away in between the stitching, but it also looked great with just the machine stitching if you didn’t want to do the cutting, great idea. Thanks so much for the video, don’t think I would have understood your directions without seeing the actual cutting away part. Fabulous card! Love the video! Thanks for the inspiration! Very pretty effect! Totally inspired me to get out my sewing machine! The stitched detail is gorgeous! Might be fun to try with a rectangle or circle shape to add some stitched stripes. Wow! What a clever way to add the veins in felt! Looks great! Fun idea. Just have to break out my handy dandy sewing machine if I can find it under my craft clutter! ? I prefer hand stitching to using a machine. I think the Butterfly Hope die would be a fun one for this technique. Why did I give away all my felt? I think I’ll try it with paper and see if I get anything close to how great Heather’s card is. Oh my what a wonderful fall card! I just love it. What a neat technique. When I first saw it I was wondering how you did it! Now I know =) Thanks Heather! What a great stitching idea! I can think of lots of projects to use this technique. Thanks for sharing. Cheers. looks like an interesting technique, Heather. I think it works perfectly on that square card. I’m anxious to give it a try! thanks for this wool idea! So lovely! The felt really adds nice texture and dimension. Your cute project has inspired me to get out my sewing machine, make some pretty leaves and finally hem my jeans that have been sitting there for months. Thanks!! What a lovely and perfect card for Fall Holidays! Thank you for sharing this, I love working with Wool – Felt. So cute! I love Papertrey’s wool felt. Once you’ve tried it it’s hard to go back to anything else. Cute idea Heather! Adore your leaves! Trying to think of other dies we might try as well…. Such a pretty card Heather, thank you for the tutorial, I love the design. Great idea to layer felt pieces and stitch…then cut out details. Love your leaves and I enjoy working with felt! I have to give this method a try. Thanks! The card is so pretty, I love all the texture! The leaves are beautiful, Heather! I think is one of my favorite new techniques, thanks Heather! I always live Heather’s creations! These are fab! These are so sweet. I’ve never used felt embellishments on my cards before. I think it might be time to give it a try. You made it look so easy. Felt is definitely the perfect accessory for Fall cards. Love these cards – that wool felt sure does step them up! I will definitely be trying this technique. oh my amazing project, thanks for the ideas! I love everything Heather does. This was very creative. Thanks for the inspiration. I love the look and texture wool gives to cards. What a great idea, can’t wait to try it!! Those leaves looked so difficult to make, but were actually quite simple! I loved learning this technique! Thank you! I love the look of the wool felt leaves added to the stamped elements of the card. So lovely! Fun, Heather! All my felt is what I’ve ordered for baby booties…I’ll have to see what dies will be good for the colors I have. I love this–but I always love Heather’s creations! Awesome creations! Makes me feel like sewing again! Wool felt and fall just go together. Gorgeous colors for those leaves. I love the technique and I’m wondering how else to apply it to projects…lovely cards. Love those leaves, especially with the stitching! I think this technique is also perfect for winter mittens and sweaters, since it evokes such warmth. Looking forward to trying this next technique! Such a cute project! Anything with an abundance of drying time or requiring me to dig out the sewing machine is not going to happen this weekend but I do love the technique. SO VERY CUTE. YOU INSPIRED ME. I HAVE MADE A DOZEN LEAVES AND ONE CHRISTMAS TREE! Lovely fall card even though I’m not ready for fall yet. This technique is pure genius! This “old dog” is learning a lot of new tricks. Such an easy, fun way to use felt. Love it! Your video was so fun. Your technique has me yearning for fall and candy corn! ? Gah!!! Love felt projects and you’ve made it so easy! Beautiful and inspiring, thanks for sharing! WOW! great way to do this wool challenge, stitching these amazing leaves for your card. Fabulous!!! I love the leaves on here! These are the cutest cards. The colors are wonderful. Don’t you just love autumn colors? I love the stamp also. These leaves are Beautiful!! What a great idea!! Love the fall colors and the felt leaves. This is a fabulous technique!! I’ve never played with felt, but I want to now!! Thanks so much for the fabulous inspiration!! Love your beautiful card. Now I really want to get a sewing machine. Just loving the wonderful detail stitching on the leaves. So creative. This is a wonderful idea and so creative. Wish I had a sewing machine. Gorgeous fall card. And what an awesome technique! Gorgeous card, love the felt leaves. Cute leaves, can’t wait to give it try! Very clever. Snipping away the extra material is just so much easier than trying to sew on the veins. Love this idea! Great project! Cool technique and beautiful cards! I just ordered the Beautiful Berries:Autumn set on Friday — can’t wait to play with it! Oh my, I love it. I never would have thought of this. Darling cards! Makes me want to learn to sew. Beautiful leaves and really cool cards, thank you Heather! Love Heather’s tutorial and project! I’m not a sewer but will see if I have time to attempt this one. Appreciate the tip for sewing and then cutting the top layer. Fabulous added texture, Heather! Love this technique, Heather! I also love your Fall cards. Thanks for the video and for all the wonderful inspiration! Thanks for encouraging me to pull out the felt! What a sweet embellishment! I love this tutorial. I can see making Christmas ornaments with this technique. This is a really clever idea. Love the look of those leaves! Absolutely love the leaves! They make such a gorgeous card and beautiful colors. Love the stitching idea. The leaves made out of the felt are great!! I just love the felt embellishments. Beautiful fall cards! Lovely stitching too! I adore the cards that Heather made. The combination of felt colors is glorious. I love Heather’s style and everything she creates. These are so festive! What a cute card! And a fun project that makes me pull out all that felt I have! I love layering with wool! Alas, all my PTI felt is in storage until we are moved, so I couldn’t try this today. 🙁 But you can be assured I will in a month or so! Thanks for the great video Heather! Such a warm and cozy project! Thanks for the tip on how to achieve the leaf veining! So homey and warm! You stitched up an adorable autumn card. Heather’s leaves are so pretty and so clever! For the safe of saving some time, I chose faux stitching my leaves. Love the look of felt on cards! Can’t wait to give this a try when I have more free time. Gorgeous! Thank you so much for all you share with us! Love the veiny snips! 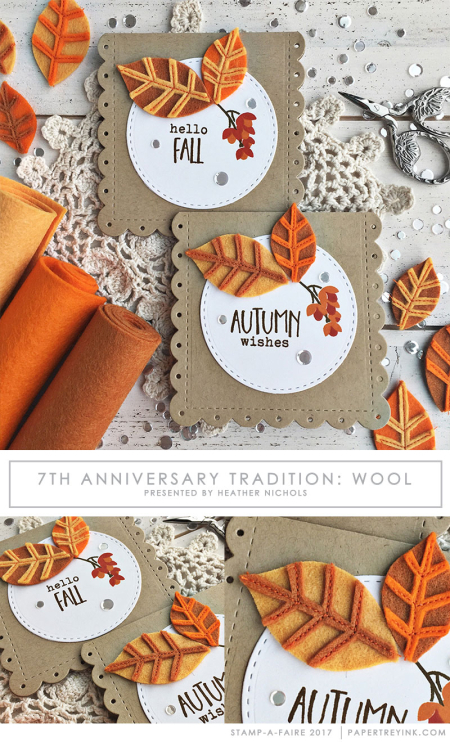 The felt leaves are perfect on this fall card! Fun! What we can’t do with felt! Clever idea of creating these embellishments. All the warm fuzzies for these cards & this simple technique which gives such a wow factor to a card. Heather your card us just lovely. I had to hand sew the leaves as no room on desk for sewing machine. Too much mess lol. Heather, love the look of sewn felt on a card, so warm and fuzzy! Always love seeing Heather’s fabulous techniques. I get the warm fuzzies looking at those fun fall leaves! Love this idea of using the traditional anniversaries for PTI’s 10th! Fun! Used what I had, it’s unclear how I could not have something suitable but there you are!! Love everything about your sweet little card, Heather! These cards are so sweet! I love the colors and the cut-away technique! Totally love your projects! Can’t wait to use my felt again! These cards are super cute! The wool embellishments are perfect for fall! What great fall projects, Heather! Love these! The stitching and the wool die cuts add a cozy feel to the cards. I have used wool die cuts to embellish cards but haven’t tried to stitch on them. I can’t wait to try this technique. Love the cut out stitched felt look! What a fabulous idea!